Three students were huddled under this bell shape, cut from supersized paper, when I caught this glimpse through a window at the Merchant Quarter, New Lynn. 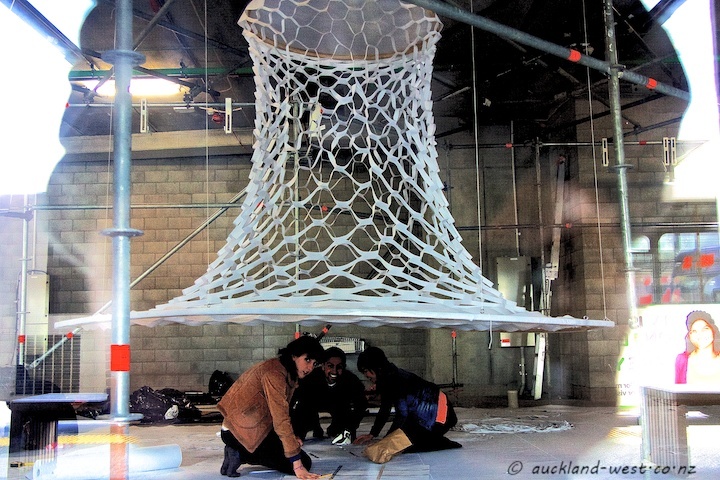 They are busy preparing their projects which will liven up New Lynn from tonight until Sunday night under the motto “Here Now – Re-Imagining New Lynn”. Looking forward to what their enthusiasm, energy and above all imagination will reveal tonight, and the following nights! More details in Monday’s post.